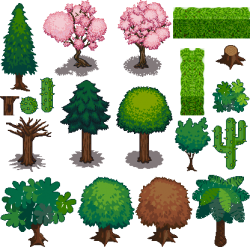 This is a misc assortment of plants repacked into a single tileset. I found this much easier to work with in Tiled. It wasn't trivial to track down all these things and get them in one place. Please see the credits file. If I missed someone or wrongly included someone please let me know, I'll fix it. Someone should probably create a green leaf version of the great pink ones. Well and making some lighter spring and yellow-reddish autuum ones should be really easy too. That's a really good and easy way to make a few more trees! I might try that some time today if I have time. Either way that's going on the to-do list because it'll add variety. Is this what you meant by a recolor? I hope this looks reasonable enough to be useful. Should credits.zip contain name all who made something for this pack or just names who participated to LPC? Using the cactus in Stendhal. Thank you very much! May possibly use the palm as well.